Family outings where there’s plenty to do for every member of the gang are smooth, and definitely more fun than being cooped up in a small area. Sazanami Park in Uruma City is perfect on every count, with its super playground filled with wooden playground equipment, including slides, swings, and a seesaw. 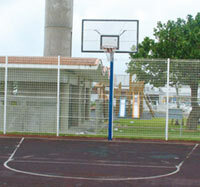 For the slightly older set, there are basketball courts available for boys and girls. There are mattresses cushioning the activities of the playground equipment. 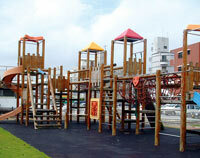 Picnics are easy at Sazanami Park, with its two open lounges and wide open spaces. Park officials do recommend though that families not wanting to use the gazebo lounges bring their own parasols or tents, particularly in summer. San-A and Kanehide Supermarkets are adjacent to the park, making it easy to pick up those extra picnic items. Rest rooms are available at the park. The park has no direct parking; visitors need to park nearby. Awase Fishing Port is also near the Sazanami Park. The port offers visitors opportunities to see live fish and seashells. All are available for purchase. To visit Sazanami Park, exit Kadena Gate 2 and go straight, crossing Takahara intersection and continuing straight until San-A supermarket and a liquor store are on the left. Turn left between the supermarket and liquor store and you are at the park entrance.